Mother Nature has thrown several surprises at us lately. We are witnessing catastrophic weather events that are crippling countries. Two of these events, earthquake and flooding, are becoming more and more frequent. With the frequency of these events it is important to understand that the “special” perils for a commercial property policy do not include coverage for either of these. Earthquake and Flood have to be purchased separately. …that earthquakes “DO” occur in the Northeast? As recently as 2006 a 4.2 earthquake occurred in coastal Maine and in 2002 a 5.1 earthquake occurred in Plattsburg, NY. …that between October 2009 and September 2010 in the state of Massachusetts there were 2,121 flood claims filed with total damage in excess of $25,000,000? The majority of these claims were uninsured. …that back up of your sewer and drains, as well as sump pump failure is excluded on most policies? Keep reading to find out how to protect your business from the above risks. Flood zones are geographic areas defined by the Federal Emergency Management Agency (FEMA) according to their likelihood of flooding. These designations are based on historical data that includes frequency of flooding in the area and high water levels during those floods. These zones are depicted on a community’s Flood Insurance Rate Map (FIRM). Zone B areas are defined as moderate flood hazard, usually between the limits of the 100-year and 500-year flood areas. The 100-year flood has a 1% chance of being equaled or exceeded each year. Thus, the 100-year flood could occur more than once in a relatively short period of time or even within the same month. B Zones are also used to designate base floodplains of lesser hazards, such as areas protected by levees from 100-year flood, or shallow flooding areas with average depths of less than one foot or drainage areas less than 1 square mile. Zone C are the area of minimal flood hazard usually depicted as above the 500-year flood level meaning that there is a .2% chance that an annual flood will occur. Zone X are the area determined to be outside the 500-year flood which usually means it has a less than .2% chance to flood annually. Areas with a 1% annual chance of flooding and a 26% chance of flooding over the life of a 30-year mortgage. Depicted on maps as zones A, AE AH, AO, AR A99. Coastal areas with a 1% or greater chance of flooding and an additional hazard associated with storm waves. These areas have a 26% chance of flooding over the life of a 30-year mortgage. Depicted on maps as zones V, VE, V1-30. Areas with possible but undetermined flood hazards. No flood hazard analysis has been conducted. A flood can be one of the most costly disasters for a business to endure as it may require rebuilding of a structure, replacement of property, reconstruction of records, ceasing of business operations, etc. Often people only associate floods with hurricanes or tropical storms but some areas can also flood due to rising river waters, flash flooding from heavy rainstorms, ice jams, or rapid snow melt. To protect your business from flooding you must purchase a separate flood policy through the National Flood Insurance Program or a flood endorsement from your property carrier if available. Often though, property carriers do not offer flood policies for those in a higher hazard area. This is why the federal government established the National Flood Insurance Program through the Federal Emergency Management Agency (FEMA). Several factors are taken into consideration in the pricing of flood insurance – the flood zone, the amount of coverage purchased, age of the building, building occupancy, building design, building elevation if in a special flood hazard area, etc. In most situations there is a 30-day waiting period before flood insurance goes into effect. Blockages Due to Tree Roots: Shrubs and trees seeking moisture can make their way into sewer line cracks causing extensive damage. They can also travel a long way, and roots from different types of trees act differently. Sanitary Main: A blockage can occur in a city sanitary main and if the blockage is not detected in time, sewage from the main can back up into your business through the floor drains. Blockages due to Foreign Objects: Sticks, boards, paper products, etc, can get caught wthin the line causing a blockage. Build Up of Cooking Grease: Grease and oils washed down the sink over time will collect in the line and harden causing at least partial blocks. Note that commercial property policies do not cover the expenses to either clean up or replace damaged property caused by backup of water or sewer unless added by endorsement. Not worried about earthquakes? Well, you should be. As you can see from the image below, there has been activity in the New England area over the past years as represented by the red dots. During such catastrophic events, protecting human life remains the priority but you also need to protect your company’s financial health, survival, and ongoing success. Data for 1924-1974 is from the U.S. Geological Survey. 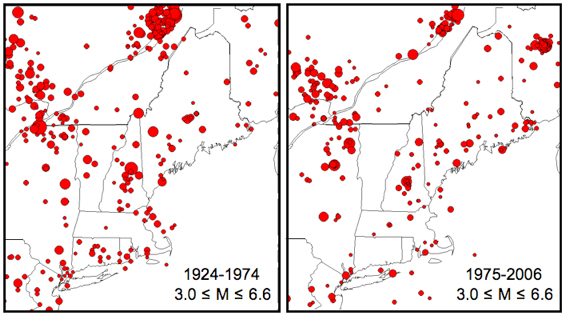 Data for 1975-2006 is from the Weston Observatory archives of earthquakes recorded by the Northeastern United States Seismic Network. Similar to flood, the standard property policy exclusions also include “Earth Movement” which entails “earthquake, including any earth sinking, rising or shifting related to such event.” If earth movement does result in a fire or explosion, the loss or damage caused by that fire or explosion would be covered. Earthquake coverage can be provided either via an endorsement to your Commercial Property policy or via a separate policy. Typically the deductible applicable to this coverage is either a flat amount or a percentage of your insured value. Will your property policy cover you if an earthquake should hit our region?